Like other biological macromolecules such as polysaccharides and nucleic acids, proteins are essential parts of all living organisms and participate in every process within cells. Many proteins are enzymes that catalyze biochemical reactions, and are vital to metabolism. 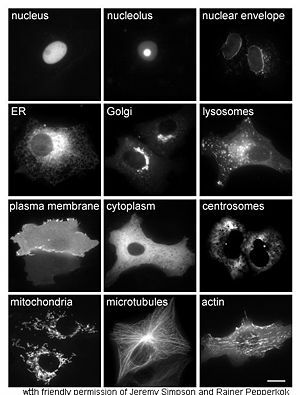 Other proteins have structural or mechanical functions, such as the proteins in the cytoskeleton, which forms a system of scaffolding that maintains cell shape. Proteins are also important in cell signaling, immune responses, cell adhesion, and the cell cycle. Protein is also a necessary component in our diet, since animals cannot synthesise all the amino acids and must obtain essential amino acids from food. Through the process of digestion, animals break down ingested protein into free amino acids that can be used for protein synthesis. The word protein comes from the Greek πρώτα ("prota"), meaning "of primary importance" and these molecules were first described and named by Jöns Jakob Berzelius in 1838. However, proteins' central role in living organisms was not fully appreciated until 1926, when James B. Sumner showed that the enzyme urease was a protein. The first protein to be sequenced was insulin, by Frederick Sanger, who won the Nobel Prize for this achievement in 1958. The first protein structures to be solved included haemoglobin and myoglobin, by Max Perutz and Sir John Cowdery Kendrew, respectively, in 1958. Both proteins' three-dimensional structures were first determined by x-ray diffraction analysis; the structures of myoglobin and haemoglobin won the 1962 Nobel Prize in Chemistry for their discoverers. Proteins are linear polymers built from 20 different L-α-amino acids. All amino acids share common structural features including an α carbon to which an amino group, a carboxyl group, and a variable side chain are bonded. Only proline differs from this basic structure, as it contains an unusual ring to the N-end amine group, which forces the CO-NH amide moiety into a fixed conformation. The side chains of the standard amino acids, detailed in the list of standard amino acids, have different chemical properties that produce proteins' three-dimensional structure and are therefore critical to protein function. The amino acids in a polypeptide chain are linked by peptide bonds formed in a dehydration reaction. Once linked in the protein chain, an individual amino acid is called a residue and the linked series of carbon, nitrogen, and oxygen atoms are known as the main chain or protein backbone. The peptide bond has two resonance forms that contribute some double bond character and inhibit rotation around its axis, so that the alpha carbons are roughly coplanar. The other two dihedral angles in the peptide bond determine the local shape assumed by the protein backbone. Due to the chemical structure of the individual amino acids, the protein chain has directionality. The end of the protein with a free carboxyl group is known as the C-terminus or carboxy terminus, while the end with a free amino group is known as the N-terminus or amino terminus. There is some ambiguity between the usage of the words protein, polypeptide, and peptide. Protein is generally used to refer to the complete biological molecule in a stable conformation, while peptide is generally reserved for a short amino acid oligomers often lacking a stable 3-dimensional structure. However, the boundary between the two is ill-defined and usually lies near 20-30 residues. Polypeptide can refer to any single linear chain of amino acids, usually regardless of length, but often implies an absence of a single defined conformation. Proteins are assembled from amino acids using information encoded in genes. Each protein has its own unique amino acid sequence that is specified by the nucleotide sequence of the gene encoding this protein. The genetic code is a set of three-nucleotide sets called codons and each three-nucleotide combination stands for an amino acid, for example AUG stands for methionine. Because DNA contains four nucleotides, the total number of possible codons is 64; hence, there is some redundancy in the genetic code and some amino acids are specified by more than one codon. Genes encoded in DNA are first transcribed into pre-messenger RNA (mRNA) by proteins such as RNA polymerase. Most organisms then process the pre-mRNA (also known as a primary transcript) using various forms of post-transcriptional modification to form the mature mRNA, which is then used as a template for protein synthesis by the ribosome. In prokaryotes the mRNA may either be used as soon as it is produced, or be bound by a ribosome after having moved away from the nucleoid. In contrast, eukaryotes make mRNA in the cell nucleus and then translocate it across the nuclear membrane into the cytoplasm, where protein synthesis then takes place. The rate of protein synthesis is higher in prokaryotes than eukaryotes and can reach up to 20 amino acids per second. Proteins are not entirely rigid molecules. In addition to these levels of structure, proteins may shift between several related structures in performing their biological function. In the context of these functional rearrangements, these tertiary or quaternary structures are usually referred to as "conformations," and transitions between them are called conformational changes. Such changes are often induced by the binding of a substrate molecule to an enzyme's active site, or the physical region of the protein that participates in chemical catalysis. In solution all proteins also undergo variation in structure through thermal vibration and the collision with other molecules, see the animation on the right. There are many more known gene sequences than there are solved protein structures. Further, the set of solved structures is biased toward those proteins that can be easily subjected to the experimental conditions required by one of the major structure determination methods. In particular, globular proteins are comparatively easy to crystallize in preparation for X-ray crystallography, which remains the oldest and most common structure determination technique. Membrane proteins, by contrast, are difficult to crystallize and are underrepresented in the PDB. Structural genomics initiatives have attempted to remedy these deficiencies by systematically solving representative structures of major fold classes. Protein structure prediction methods attempt to provide a means of generating a plausible structure for proteins whose structures have not been experimentally determined. Proteins are the chief actors within the cell, said to be carrying out the duties specified by the information encoded in genes. With the exception of certain types of RNA, most other biological molecules are relatively inert elements upon which proteins act. Proteins make up half the dry weight of an Escherichia coli cell, while other macromolecules such as DNA and RNA make up only 3% and 20% respectively. The set of proteins expressed in a particular cell or cell type is known as its proteome. The chief characteristic of proteins that enables them to carry out their diverse cellular functions is their ability to bind other molecules specifically and tightly. The region of the protein responsible for binding another molecule is known as the binding site and is often a depression or "pocket" on the molecular surface. This binding ability is mediated by the tertiary structure of the protein, which defines the binding site pocket, and by the chemical properties of the surrounding amino acids' side chains. Protein binding can be extraordinarily tight and specific; for example, the ribonuclease inhibitor protein binds to human angiogenin with a sub-femtomolar dissociation constant (<10-15 M) but does not bind at all to its amphibian homolog onconase (>1 M). Extremely minor chemical changes such as the addition of a single methyl group to a binding partner can sometimes suffice to nearly eliminate binding; for example, the aminoacyl tRNA synthetase specific to the amino acid valine discriminates against the very similar side chain of the amino acid isoleucine. The best-known role of proteins in the cell is their duty as enzymes, which catalyze chemical reactions. Enzymes are usually highly specific catalysts that accelerate only one or a few chemical reactions. Enzymes effect most of the reactions involved in metabolism and catabolism as well as DNA replication, DNA repair, and RNA synthesis. Some enzymes act on other proteins to add or remove chemical groups in a process known as post-translational modification. About 4,000 reactions are known to be catalyzed by enzymes. The rate acceleration conferred by enzymatic catalysis is often enormous - as much as 1017-fold increase in rate over the uncatalyzed reaction in the case of orotate decarboxylase (78 million years without the enzyme, 18 milliseconds with the enzyme). The molecules bound and acted upon by enzymes are known as substrates. Although enzymes can consist of hundreds of amino acids, it is usually only a small fraction of the residues that come in contact with the substrate and an even smaller fraction - 3-4 residues on average - that are directly involved in catalysis. The region of the enzyme that binds the substrate and contains the catalytic residues is known as the active site. Antibodies are protein components of adaptive immune system whose main function is to bind antigens, or foreign substances in the body, and target them for destruction. Antibodies can be secreted into the extracellular environment or anchored in the membranes of specialized B cells known as plasma cells. While enzymes are limited in their binding affinity for their substrates by the necessity of conducting their reaction, antibodies have no such constraints. An antibody's binding affinity to its target is extraordinarily high. Many ligand transport proteins bind particular small biomolecules and transport them to other locations in the body of a multicellular organism. These proteins must have a high binding affinity when their ligand is present in high concentrations but must also release the ligand when it is present at low concentrations in the target tissues. The canonical example of a ligand-binding protein is haemoglobin, which transports oxygen from the lungs to other organs and tissues in all vertebrates and has close homologs in every biological kingdom. Structural proteins confer stiffness and rigidity to otherwise fluid biological components. Most structural proteins are fibrous proteins; for example, actin and tubulin are globular and soluble as monomers but polymerize to form long, stiff fibers that comprise the cytoskeleton, which allows the cell to maintain its shape and size. Collagen and elastin are critical components of connective tissue such as cartilage, and keratin is found in hard or filamentous structures such as hair, nails, feathers, hooves, and some animal shells. In order to perform in vitro analyses, a protein must be purified away from other cellular components. This process usually begins with cell lysis, in which a cell's membrane is disrupted and its internal contents released into a solution known as a crude lysate. The resulting mixture can be purified using ultracentrifugation, which fractionates the various cellular components into fractions containing soluble proteins; membrane lipids and proteins; cellular organelles, and nucleic acids. Precipitation by a method known as salting out can concentrate the proteins from this lysate. Various types of chromatography are then used to isolate the protein or proteins of interest based on properties such as molecular weight, net charge and binding affinity. The level of purification can be monitored using gel electrophoresis if the desired protein's molecular weight is known, by spectroscopy if the protein has distinguishable spectroscopic features, or by enzyme assays if the protein has enzymatic activity. Most microorganisms and plants can biosynthesize all 20 standard amino acids, while animals must obtain some of the amino acids from the diet. Key enzymes in the biosynthetic pathways that synthesize certain amino acids - such as aspartokinase, which catalyzes the first step in the synthesis of lysine, methionine, and threonine from aspartate - are not present in animals. The amino acids that an organism cannot synthesize on its own are referred to as essential amino acids. (This designation is often used to specifically identify those essential to humans.) If amino acids are present in the environment, most microorganisms can conserve energy by taking up the amino acids from the environment and downregulating their own biosynthetic pathways. Bacteria are often engineered in the laboratory to lack the genes necessary for synthesizing a particular amino acid, providing a selectable marker for the success of transfection, or the introduction of foreign DNA. In animals, amino acids are obtained through the consumption of foods containing protein. Ingested proteins are broken down through digestion, which typically involves denaturation of the protein through exposure to acid and degradation by the action of enzymes called proteases. Ingestion of essential amino acids is critical to the health of the organism, since the biosynthesis of proteins that include these amino acids is inhibited by their low concentration. Amino acids are also an important dietary source of nitrogen. Some ingested amino acids, especially those that are not essential, are not used directly for protein biosynthesis. Instead, they are converted to carbohydrates through gluconeogenesis, which is also used under starvation conditions to generate glucose from the body's own proteins, particularly those found in muscle. ^ Sumner, JB (1926). "The Isolation and Crystallization of the Enzyme Urease. Preliminary Paper". J Biol Chem 69: 435-41. ^ Muirhead H, Perutz M (1963). "Structure of haemoglobin. A three-dimensional fourier synthesis of reduced human haemoglobin at 5.5 A resolution". Nature 199 (4894): 633-8. PMID 14074546. ^ Kendrew J, Bodo G, Dintzis H, Parrish R, Wyckoff H, Phillips D (1958). "A three-dimensional model of the myoglobin molecule obtained by x-ray analysis". Nature 181 (4610): 662-6. PMID 13517261. ^ Fulton A, Isaacs W (1991). "Titin, a huge, elastic sarcomeric protein with a probable role in morphogenesis". Bioessays 13 (4): 157-61. PMID 1859393. ^ Bruckdorfer T, Marder O, Albericio F (2004). "From production of peptides in milligram amounts for research to multi-tons quantities for drugs of the future". Curr Pharm Biotechnol 5 (1): 29-43. PMID 14965208. ^ Schwarzer D, Cole P (2005). "Protein semisynthesis and expressed protein ligation: chasing a protein's tail". Curr Opin Chem Biol 9 (6): 561-9. PMID 16226484. ^ Bairoch A. (2000). "The ENZYME database in 2000". Nucleic Acids Res 28: 304-305. PMID 10592255. ^ Radzicka A, Wolfenden R. (1995). "A proficient enzyme.". Science 6 (267): 90-931. PMID 7809611. ^ Zagrovic B, Snow CD, Shirts MR, Pande VS. (2002). Simulation of folding of a small alpha-helical protein in atomistic detail using worldwide-distributed computing. J Mol Biol 323(5):927-37. ^ Herges T, Wenzel W. (2005). In silico folding of a three helix protein and characterization of its free-energy landscape in an all-atom force field. Phys Rev Let 94(1):018101. This page was last modified on 26 February 2008, at 04:48.